Looks like heavy metal. Smells like heavy metal. Must be heavy metal? NOT! Despite Autograph's long-haired, 80's heavy metal image, "Sign in Please" is actually mainstream pop-hard-rock that almost defines 1980's rock radio, along with bands like Night Ranger and even later years .38 Special. That's not to say that "Sign in Please" is bad though. It's just that their image doesn't hold up to their sound, so anyone expecting a vicious L.A. metal assault like early Crue or Ratt will be disappointed. "Sign In Please" is actually a good rockin' disc with many melodic, memorable and catchy rockers. Of course "Turn Up the Radio" was a huge hit for the band and continues to get regular airplay on rock radio two decades later. "Send Her to Me," "Nine Teen & Non-Stop", "Cloud 10," and "Friday" are all standout tracks, making the overall disc pretty solid. It seems by mid-1985 every hard rock band with even an ounce of commercial viability felt that the super-slick, watered down, keyboard-driven pop rock sound was the way to go. 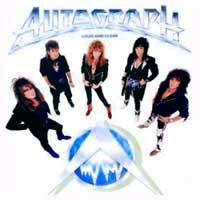 Even guys like Ted Nugent, and to a lesser extent, Judas Priest, were watering down their sound and stripping the raw rock away with lush keyboards and studio wizardry. That is certainly the case with Autograph's "That the Stuff". 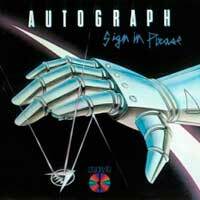 Of course, anyone listening to an Autograph CD to begin with is probably expecting cheesy 80's rock. After all, they built their reputation on "Turn Up the Radio", a sing-along anthem that was fun in it's cheesiness. Still, somehow on this second album, Autograph managed to dumb down their sound even further. Anyone expecting "Turn Up the Radio" Pt. 2 is going to be disappointed. As it turns out, most fans weren't interested and the album's singles flopped. The album opens with a keyboard driven soft rock song that leads way into the Bon Jovi-ish "Take No Prisoners". Things don't really get much better, though I will admit that the single "Blondes in Black Cars" is somewhat catchy, even if it is beyond cheesy and cliché! "Blondes in black cars, burnin' up the boulevard, blondes in black cars, and they're here for me". Vocalist Steve "Plunk" Plunkett doing his best David Lee Roth impression, though he doesn't quite have the charisma to pull it off quite the like Roth. He's a solid singer, but this sort of cheese isn't so much about singing, it's about personality. Of course there is the mandatory ballad in "Changing Hands", which is absolutely formula in it's approach and lacks emotion. "Six String Fever" is another attempt at an anthem. For whatever reason, on second pressings of this CD, the song was replaced with a cover of Grand Funk Railroad's "We're An American Band". I suppose the record company was looking for something to boost sales and though a cover would do it. They also changed the album cover art to a different female robot on a blue background. One of the shining spots on this disc is the guitar solos that break out of the doldrums. Guitarist Steve Lynch lets loose on some nice lead-work, which even if it were mediocre would shine in comparison. Lynch's solo guitar piece, "Hammerhead," a song that recalls Van Halen's "Eruption", proves just how underutilized he is on this album. The short instrumental acts as an intro into "Built for Speed". In my opinion, these would be the only songs I would describe as hard rock on this album and definitely the standout cuts. With the band's sophomore release, they really mis-guessed what their audience was looking for. Instead of turning up the radio, these guys turn down the rock 'n' roll and cranked out something that is plastic and bland. For those who enjoyed the band's debut, however, the band would redeem themselves with their third release "Loud and Clear". Autograph are most known for their 1984 rock and roll anthem, "Turn Up the Radio". The band's sophomore album was far too light for most fans tastes and didn't do well for the band at all. However, there was still life in this band after "Sign in Please". "Loud and Clear" is actually a better album than the band's more popular "Sign in Please". The guitars are turned up and the keyboards become less distracting. Steve Lynch's guitar playing is at the forefront of the music, especially songs like the hard rocking title track. Of course, Autograph are a commercial, hard rock band, so there are the obvious attempts at radio hits. "Dance All Night" is "Turn Up the Radio" part two. However, it hasn't been overplayed on the radio to point of annoyance, so I tend to like it better. "She Never Looked That Good For Me" and "Bad Boy" are bubblegum pop metal of the highest order, yet I still find them immensely more enjoyable than anything on "That's the Stuff". "She's A Tease" is a sleazy, hard rocker with a heavy guitar bite. Basically on "Loud and Clear" Autograph have tried to balance the melody and pop hooks with some muscle this time around. If "Loud and Clear" had been the follow-up to "Sign in Please" instead of the far too bubblegum "This is the Stuff", I tend to think that Autograph would have continued to enjoy the success they had seen on their debut. I've always assumed that's what the album's title referred to. They heard the cries of their fans loud and clear. The title song "Loud and Clear" featured a music video with Ozzy Osbourne and Vince Neil as extras. 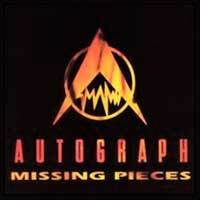 "Missing Pieces" is one of those odds and sods albums containing unreleased tracks, demo versions, etc. In the case of Autograph, this might be one of the best albums they never released. "Missing Pieces" features ten songs of feel-good, 1980's party rock. The songs, for the most part, are loosely recorded and guitar heavy. This is not true of every song. "When I'm Gone", for instance, is a Def Leppard inspired pop. The song sounds like it could have been a demo for Def Leppard's "Hysteria", right down to the big layered chorus. The majority of the songs, however, are just straight-forward, mindless, party anthems. Songs like "All Night Long", "One-Way Dead-End Street", "Angel in Black" and "Sanctuary" are all as good as, or better than, anything the band had recorded previously. The songs are ultra-catchy and pop based, but rock hard and aren't polished to the point of overkill. Sure, the lyrics are cheesy, but no one listens to a band like Autograph for thoughtful lyrics. It's just good time rock and roll. I wonder, had the band recorded some of these harder rocking songs for "That's the Stuff", if their popularity would not have wained. "Angel is Black" was also recorded by Bangalore Choir. The demo version of "Turn Up the Radio" is an interesting listen. The biggest difference is in the lyrics on the chorus. "Turn up the radio, I need the music, give me some more, turn up the tape machine, I want to feel it and you know what I mean." Like it or not, having grown up in the 80's, that song is ingrained into my brain, and hearing different lyrics just seems odd. The album version of the song, of course, was a huge hit for the band pushing their debut to gold status. It's interesting reading notes from the band that their record company at the time felt the song was throw-away and didn't even want it on the album. It's also worth mentioning that the recording values of the songs vary a bit, due to the fact that these songs were recorded at various times under various conditions. However, thanks to decent mastering, the album flows well as a whole.